The organizer of the ECO Game contest at Electric Castle 2017 (further referred to as The Contest) is MAINOI Association, with its headquarters in Brașov, Sitarului Street, nr 11, bl. C30, sc. A, et. 2, ap. 5, registered in the Associations and Foundations Registry held at the Brașov Law Court , position 96/28.10.2014, fiscal code nr RO33934630, account number RO06RNCB0053144521160001, opened at BCR bank, represented by Nicoleta Cîrjan, as President, further referred to as The Organizer. 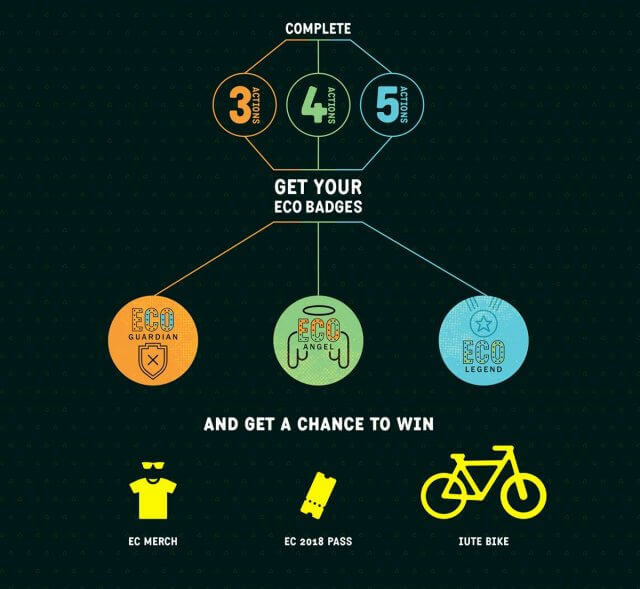 The contest is going to deploy between 12th and 16th of July, in the camping area of the Electric Castle Festival 2017, and the validation of the enrolment in The Contest can be done in the special designated area – the ECO Spot. Every individual that has access in the festival camping has the right to participate in The Contest. The Organizers and any other people involved in the organization and deployment of the contest do not have the right to participate. Signing up is done between 12th of July 2017, from 4 pm to 16th of July, starting 2 pm. The participants have to complete the actions from all 5 categories: Energy, Water, Social, Transport and Waste. The required actions are validated by one of the volunteers from our ECO-crew by directly adding them onto our database at the ECO Spot. Every action added up once. Only people with camping access can sign up for the contest. Participants must give their contact details correctly, agree that they would be processed by the Organizers and agree with the contest’s Rules. Pedals Battle: pedal on the installation of energy production for at least a three minutes cycle. 5-minute shower: in the morning, between 9 am and 12 pm and in the afternoon from 4 pm to 7 pm, our ECO volunteers will time the participants willing to take showers in less than 5 minutes. Shower-in-2: if you can’t take a quick shower, then at least share it with someone. 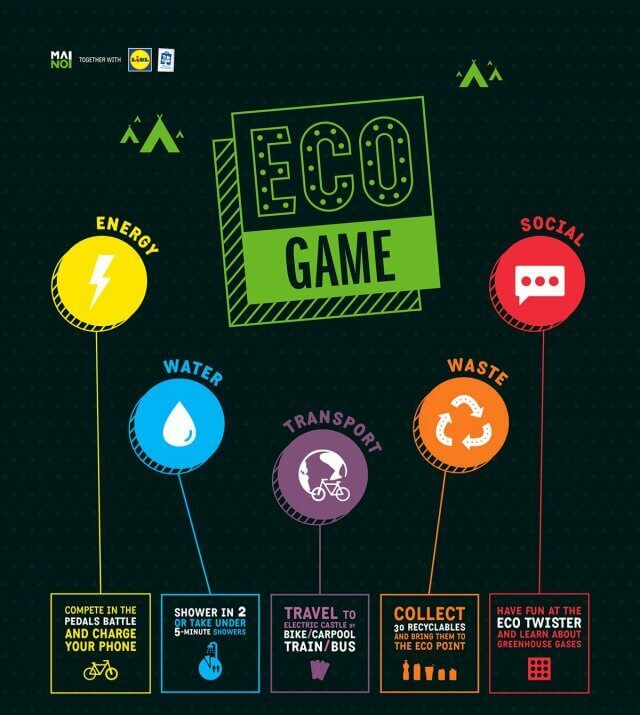 ECO volunteers will be in the uncovered area of free showers, in the morning between 9 am and 12 pm and in the afternoon from 14 pm to 17 pm, so let them know when you want to complete the action for the ECO Game. Travel by bike: if you come to the festival by bike, post a photo of you on the saddle somewhere along the way, on Facebook or Instagram, make it public and use the hashtag: #ecocitizen. Then, when you get to the camping, show us your post at the ECO Spot. Travel by train: if you come to the festival by train, show us your train ticket. The final destination can be either Cluj-Napoca or Bonțida, and the date of your travelling must be between the 11th and the 14th of July. Travel with Carpooling: if you used a site of carpooling to get here, show us the account and the trip. Travel 4-in-a-car: if you get here by car or have at least 3 passengers in the car, post a picture of you on the road, on Facebook or Instagram, make it public and use the hashtag: #ecocitizen. Then, when you get to the camping, show us your post at the ECO Spot. Travel by bus: show us your bus ticket that you used to get here. The final destination can be either Cluj-Napoca or Bonțida, and the date of your travelling must be between the 11th and the 14th of July. Selectively collect 30 packings (uncontaminated: without food marks or grease spots) and bring them to the ECO Spot: plastic cups, cans, plastic shot glasses, cigarette packs etc. ECO-Twister Game: play twister at the ECO Spot and learn about greenhouse gases. There will be 3 final awards given according to the number of different actions done by the participants. The participant that does 3 actions can enter the drawing lots for the 3rd place. The participant that does 4 actions can enter the drawing lots for the places 2nd and 3rd. The participant that does 5 actions can enter the drawing lots for the first, 2nd and 3rd places. The winners shall be determined by lottery. 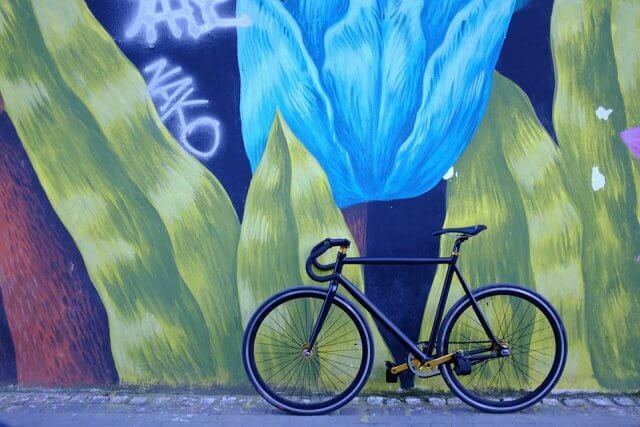 This black beauty can be yours if you play The ECO Game. Eco Legend – if they do 5 activities. The awards will be given at the ECO-Spot on 16th of July, between 16 pm and 19 pm. Final prizes will be awarded during the Electric Castle Festival, at the ECO area, on the 16th of July, between 16 pm and 19 pm. The badges will be given on the spot, in limited stock. If they are not present at the ECO Spot at the time of the awarding, the winners will be contacted by phone and SMS, using the phone numbers that were provided during their application. Also if they don’t claim their prizes in 24 h in the festival area, they can receive them by courier and support the shipping fees. The winners cannot opt to receive the values of the prizes in cash or other objects and can’t solicit other modifications. The organizer can modify the rules at any time, by making it public on the website: www.mainoi.ro. Participation/Implementation regulation it’s available for every solicitation on: www.mainoi.ro. Stay tuned with all the contest updates and tell your Electric friends about it by accessing our Facebook event: ECO Citizens of Electric Castle 2017. WE ARE THE PEOPLE WHO WILL GREEN THE WORLD!